Buddha was born in Shakya (Shakya) Kingdom of Kapilvastu which lies in present-day Rupandehi district, Lumbini zone of Nepal. It has not been possible to assign with certainty the year in which Prince Siddhartha (the birth name of the Buddha) was born, it is usually placed at around 623 BCE. 10.74% of Nepal's population practice Buddhism, consisting mainly of Tibeto-Burman-speaking ethnicities. In Nepal's hill and mountain regions Hinduism has absorbed Buddhist tenets to such an extent that in many cases they have shared deities as well as temples. For instance, the Muktinath Temple is sacred and a common house of worship for both Hindus and Buddhists. Swayambhunath stupa and prayer flags. In Nepal majority of people identify as Hindu, however, Buddhist influences are pervasive in most aspects of Nepali culture to an extent that Buddhist and Hindu temples are shared places of worship for peoples of both faith so that, unlike, in other countries, the distinction between Hinduism and Buddhism in Nepal is not always clear. During the reign of King Aṃśuvarman, the Nepalese princess Bhrikuti played a significant role in spreading and developing Buddhism in Tibet. Tibetan Buddhist architecture has long been influenced by Nepalese artists and sculptors like Araniko. The sacred Buddhist texts in Mahayana Buddhism are mainly written in the Ranjana alphabet, the script of the Newars, or scripts like Lantsa, which are derived from Ranjana. Among the Tibeto-Burman-speaking peoples, Tibetan Buddhism is the most widely practised form. Newar Buddhism is a form of Vajrayana influenced by Theravada Buddhism. Many Buddhist groups are also influenced by Hinduism. Buddhism is the dominant religion of the thinly populated northern areas, which are inhabited by Tibetan-related peoples, namely the Sherpa, Lopa, Manangi, Thakali, Lhomi, Dolpa and Nyimba. They constitute a small minority of the country's population. Ethnic groups that live in central Nepal such as the Gurungs, Lepcha, Tamang, Magar, Newars, Yakkha, Thami, Chhantyal and Chepang are also Buddhist. These ethnic groups have larger populations compared to their northern neighbours. They came under the influence of Hinduism due to their close contacts with the Hindu castes. In turn, many of them eventually adopted Hinduism and have been largely integrated into the caste system. The Kirati people, especially the Limbu and the Rai people, have also adopted Tibetan Buddhist practises from their Buddhist neighbours. The Jirel people, who are considered a Kirati, have also adopted Tibetan Buddhism. Buddha was born as Prince Siddhartha in Nepal. He attained enlightenment under the Bodhi Tree in Bodh Gaya, in present-day Bihar, India. He there preached his teachings and thus Buddhism came into existence. 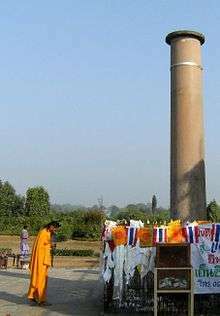 Emperor Ashoka of the Maurya Empire put up a pillar at Lumbini, the birthplace of the Buddha, in the second century BCE. After the Third Buddhist council, Ashoka missionaries to Nepal. It is also believed that Ashoka went to Patan and had four stupas built there. It is believed that his daughter Charumati established the village of Chabahil, which is located between Kathmandu and Bodhnath.. The Licchavi period saw the flourishing of both Hinduism and Buddhism in Nepal. Excellent examples of Buddhist art of the period are the half-sunken Buddha in Pashupatinath, the sleeping Vishnu in Budhanilkantha, and the statue of Buddha and the various representations of Vishnu in Changu Narayan. Ancient Buddhist texts claim that Mulasarvasti Vadavinaya (better known as the Shakyas of Kapilvastu, Bhikshu Ananda, and the Baniyas of Sravasti) came to Nepal, then known as Newal, from Tibet. Another Buddhist text, the Manjushrimula Kalpa, mentioned Manadeva as the King of Nepal Mandala. Researchers believe the Mulasarvastivadavinaya was written in the 2nd century CE, and that the Manjushriulakalpa was written during Manadeva's reign. The Swayambhu Purana, the ancient Buddhist Purana text, and a Licchavi inscription all mentioned Nepal Mandala. Buddhist inscriptions and chronicles and Tibetan sources also record a few tantric Buddhist deities, namely Aksyobhya, Amitabha, Vajrayogini, Vajrabhairava, Usnisavijaya and Samantabhadra. Strong influence from Animism resulted in belief in Buddhist deities such as the Pancaraksas. Religious tolerance and syncretism were stressed during the Licchavi period. King Manadeva paid homage at both Hindu and Buddhist sites. His family subsequently found expression for their beliefs in various religions. The worship of the Caitya and the Rath Jatra cart festival of Avalokitesvara were introduced around this period. Many ancient sites in the Kathmandu Valley were identified with major Buddhist Caityas, such as Swayambhunath, Boudhanath, Kathmandu and the four "Ashoka" stupas of Patan, and another two hundred stone caityas dating from the Licchavi Period, were testified to the widespread antiquity of caitya worship. It is possible that this practice, in its earliest incarnation, was related to the worship of stones, which may have originated in the early, rival Kirata inhabitants of the Valley, prior to the Licchavis. According to one of the earliest Licchavi inscriptions, Caitya worship ordinarily consisted of ritual circumambulation of the caitya and offering standard items such as incense, colored powder, oil lamps and ablutions. At times, the inscriptions indicate, it could even involve resurfacing an existing Caitya and covering the new surface with many elaborate paintings. Caitya worship was an important factor in bringing more of the proto-Newar tribal inhabitants into the Buddhist fold, as it was a devotional practice designed for the general public. Thus, the masses probably began practicing the cart festival of Avalokitesvara/Matsyendranath (Jana Baha Dyah Jatra and Bunga Dyah Jatra) during the latter half of the seventh century AD. This festival was celebrated by hundreds or even thousands of people, who helped to construct and transport a huge, wheeled cart that bore the image of Avalokitesvara for several days or weeks along a specific route. The introduction of this festival must have been an instant success among the majority of the Kathmandu Valley population. This strengthened Buddhism's standing in relation to the other Hindu and Animist faiths of the Valley at the time. Forty stone inscriptions made some mention of Buddhism throughout the Licchavi period. Most of the references are concerned with monasticism. However, almost nothing is known about the day-to-day life in the Vihara monasteries or how they functioned administratively. 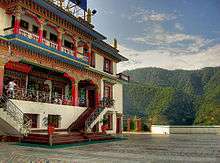 The names of the fifteen Buddhist monasteries are known, and it is clear from the context in which some of these are named that they are among the most important religious sites of that time. It is not known for certain what schools of Buddhism were most prominent at the time. But the strongest early influences (aside from an even earlier probable substratum of Pali Buddhism) probably came from the Mahasanghika, Sammitiya and the Sarvastivada schools. The Makhyamaka and Yogacara schools were thought to be more influential in the later period with the emergence and growth of the Vajrayana school. Inscriptional evidence also proves that there was a string of traditional methods of making religious gifts. These offerings were used for earning blessing and making merit, and the women of the Buddhist seem to have taken the lead in offering these gifts. Strikingly, parallel points within the Buddhist cave contain inscriptions of Maharashtra, which predated the Licchvi Nepal. The references in the Licchavi inscriptions to the Mahayana and Vajrayana will be mentioned below in connection with Buddhist art and notable Buddhist figures of the Licchavi period. A Licchavi king, Amsuvarma, married his daughter Bhrikuti to the ruler of Tibet, King Songtsen Gampo. According to legend, she received the begging bowl of the Buddha as part of her wedding dowry. It is believed that she introduced Buddhism into Tibet. she is also believed as a reincarnation of the Green Tara of Tibetan Buddhism, who is seen in many Buddhist Thangkas. Lichhavi period is known as the golden time for Buddhism. 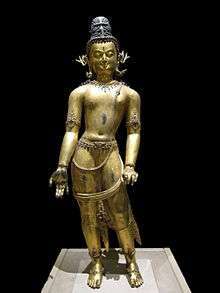 The Malla dynasty saw to the golden period of the syncretism of Hindu and Buddhist art forms by the Newar. The Paubha, the Newar counterpart of the Tibetan Buddhist Thangka, flourished in this period. During the reign of Jayasthiti Malla, after implementation of Manudharmasastra, celibate monks were banned from practicing in Nepal. This gave way to the decelebate Newar Buddhism. Because of this, Theravada Buddhism was lost in Nepal only to be revitalized in the beginning of the 20th century. The Shah dynasty saw the decline of Buddhism in Nepal where it eventually merged with Hinduism as the Hindu Gurkha rose to prominence. In the north, the Mustang kingdom ruled by the Buddhist Lopa and the Thakali saw to the flourishing of Vajrayana (Tibetan Buddhism) in the North. Modern Newar Buddhist practises in Nepal have largely been absorbed into mainstream Hinduism, although certain distinct practises, art forms and castes do remain. In the north, people of Tibetan origin continued to be the much-unchanged practises of Tibetan Buddhism, especially in the case of the Nyimba of Northwest Nepal. On the other hand, the Thakali, who had traditionally played an important role in the Nepali society but yet retained Tibetan Buddhism, have begun to embrace Hinduism as well in the recent years. It is significant to note that during the autoratic Rana regime, several Theravada Buddhists were banished from Nepal for preaching Buddhism. The Banishment of Buddhist monks from Nepal in 1926 and 1944 was prompted by an attempt to suppress the revival of Theravada Buddhism which began in the 1920s. Also, the rediscovery of Lumbini, the birthplace of Buddha, occurred in this era with contributions from among others, General Khadga Sumsher Rana. After the overthrow of the Rana dynasty in 1951, Buddhism gradually developed in the country. 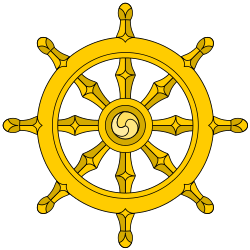 Theravada Buddhists played a greatly significant role for the Buddhist revival campaign in modern Nepal since the 1920s. This revival movement has changed Buddhism from a religion of some ethnic groups and castes to going beyond the caste and ethnic religion in Nepal. Presently, there are three main Buddhist schools; Tibetan Buddhism, Newar Buddhism and Theravada Buddhism. 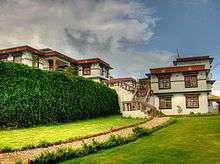 Tourism is another important factor for promoting Nepali Buddhism to the world. Every year, Kathmandu can receive more than 10,000 travellers from all over the world just to visit the Boudhanath and the Swayambhunath stupas. These are the remarkable and significant architectural sites, which are only found in Nepal. Apart from these two main Buddhist monuments there are hundreds of Buddhist monuments on every corner of the streets of Kathmandu and in other main cities of Nepal. Nepal officially became a secular state in 2006. All religions in Nepal now have equal opportunities to propagate according to their belief. ↑ Smith, Vincent A. (1914). The Early History of India from 600 B.C. to the Muhammadan Conquest Including the Invasion of Alexander the Great (3rd ed.). London: Oxford University Press. pp. 168–169. ↑ UNESCO (2012). "Lumbini, the Birthplace of the Lord Buddha". UNESCO: World Heritage Centre. ↑ Dahal, Dilli Ram (2003). "Social Composition of the Population: Caste/Ethnicity and Religion in Nepal" (PDF). Population Monograph of Nepal 2003. Central Bureau of Statistics (CBS), Government of Nepal. 1: 104–106. Archived from the original (PDF) on January 7, 2014. ↑ Shastri, G. C (July 1968). "Hinduism and Buddhism in Nepal" (PDF). Ancient Nepal: Journal of the Department of Archaeology. 4: 48–51. Archived from the original (PDF) on July 6, 2012. ↑ Murthy, K. Krishna (1989). "Advent of Buddhism". Buddhism in Tibet. Delhi, India: Sundeep Prakashan. p. 15. ISBN 81-85067-16-3. ↑ "Theravada Buddhism in Modern Nepal". Lumbini Nepalese Buddha Dharma Society (UK). Retrieved 22 May 2013. ↑ "buddhistview.com". Retrieved 1 March 2015. ↑ "Dhammaduta: The Theravada Bhikkhu Sangha in Nepal". Retrieved 1 March 2015. Buswell, Robert E., ed. (2004). Encyclopedia of Buddhism (Nepal). Macmillan Reference USA. pp. 588–592. ISBN 0-02-865718-7. Mitra, Rajendralala (1882). The Sanskrit Buddhist Literature of Nepal. Asiatic Society of Bengal, Calcutta.